Some friends recently took a trip to Laughlin, Nevada for a few days. Laughlin and the adjacent town of Bullhead City, Arizona are on the Colorado River where Arizona, Nevada, and California converge. Laughlin earns its living by being a closer, smaller, less expensive version of Las Vegas. It’s a reasonable drive from the population centers of southern California and does a brisk business with retirement age folks. Bullhead City is a quiet retirement/vacation destination that benefits from lower land costs and favorable Arizona tax policies relative to California. Federal and state dams, reservoirs, hydro power stations, and interstate highways make this patch of desert wasteland habitable. If you’re looking for a quiet, sunny, affordable place to settle down and collect your pension with a few casinos down the road this might just be Nirvana. 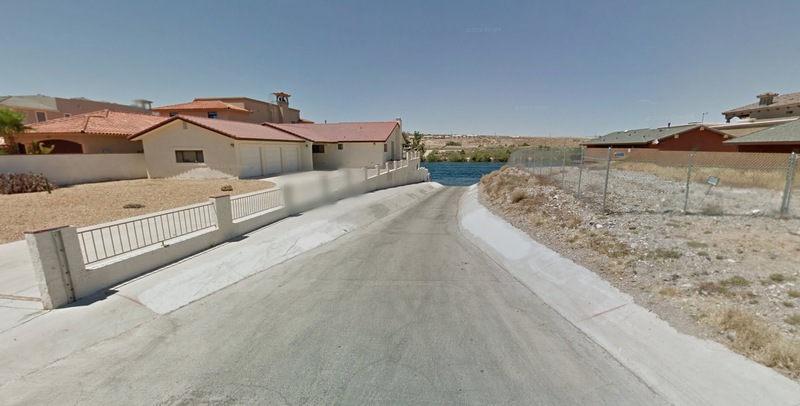 The primary attraction in Bullhead City, other than nearby Laughlin casinos, is the river. In a desert environment waterfront property sells at a particular premium. 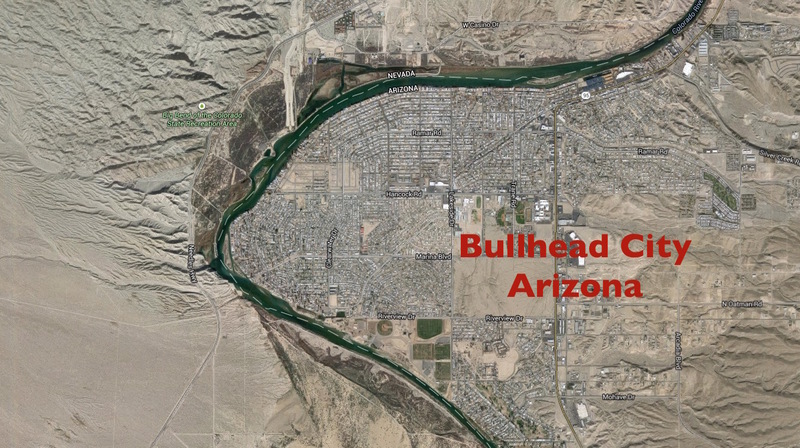 In fact, the river is probably the only reason Bullhead City even exists in the first place. So it’s understandable that the development pattern that emerged involved carving the riverfront into hundreds of long narrow lots where each home would have its own private dock. But there are problems with this style of development. As you drive along the street that parallels the river you are confronted by a continuous wall of garage doors and driveways. The homes are packed tightly together so there’s no access or even views of the water. If you aren’t inside one of these houses it’s difficult to even know the river exists. Aside from a few gaps where a storm water drainage channel or dead end street interrupts the barrage of private homes the rest of the town is completely cut off from the water. What could have been an amazing public amenity is only accidentally accessible at a few points. I’m going to take a guess here and say that when too many people arrive at one of these breaches to go swimming or park near the river at night for a little romantic inspiration the homeowners next door tend to call the cops for disturbing the peace or trespassing. The cops no doubt know whose taxes pay their salaries. “Move along.” On the one hand people paid good money for their waterfront property and they have every right to enjoying it. Full stop. I don’t challenge that in the least. But let’s look at property value distributions in the immediate three or four block zone from the river. 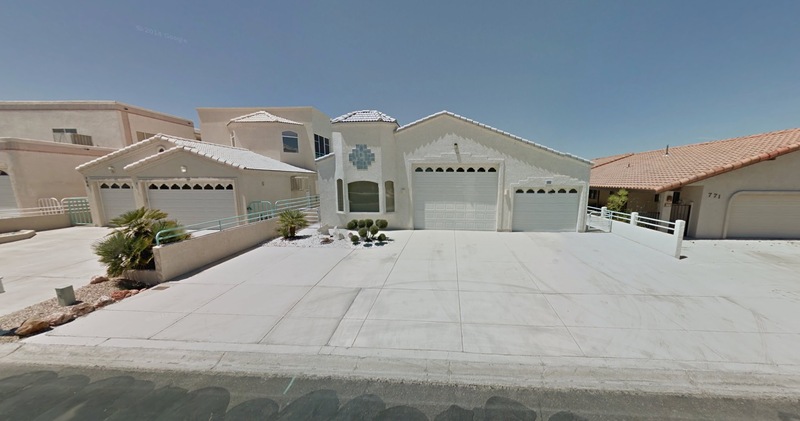 I got on to several real estate listing sites and explored property values in Bullhead City. 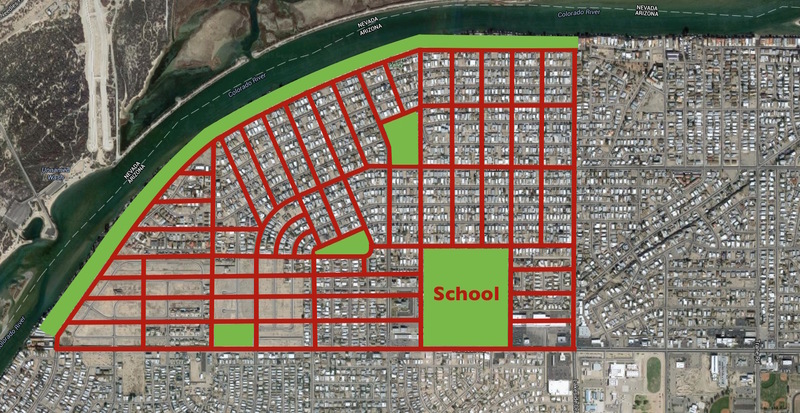 Here’s an example of what an all-or-nothing development pattern means for a town. At this moment there are properties on the riverfront for sale in the $760,000 range. Directly across the street similar homes are listed for $92,500. 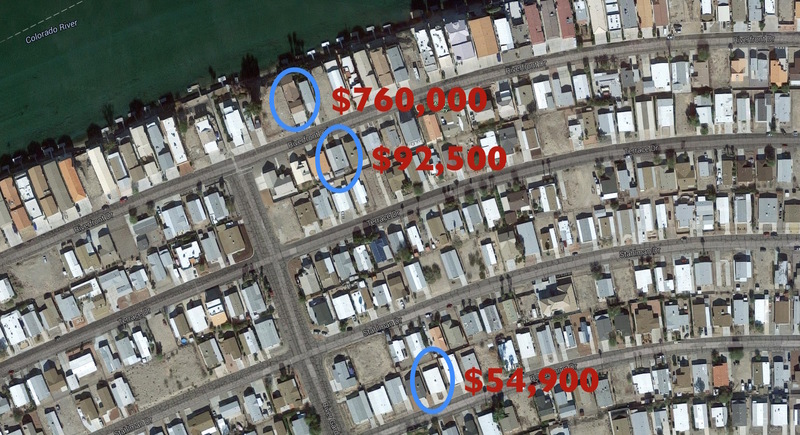 Three blocks in and you’re looking at $54,900 for a mobile home. You could say that this is a well balanced community with residential offerings at a wide range of price points. And you’d be right. Sort of. But there’s a tremendous lost opportunity here in terms of economic development for the town as a whole. It looks like the Rotary Club or someone established a large public riverside park for the community including a cluster of isolated baseball diamonds and a skateboard park. You’d have to drive to the park from most houses in town though. This kind of park is actually too large to add much value to nearby homes or businesses. It’s a very low value and generally unhelpful open space. And let’s be honest here and acknowledge that at this point there’s absolutely nothing natural about the Colorado River itself. It’s part aqueduct, part reservoir, and part power plant these days. Thanks to the Army Corps of Engineers it will never flood, although it may dry up completely given the prolonged drought. And every inch of the river across multiple states has been reconfigured and regulated at great public expense. In contrast, here’s an example of the way many towns were designed in times past. 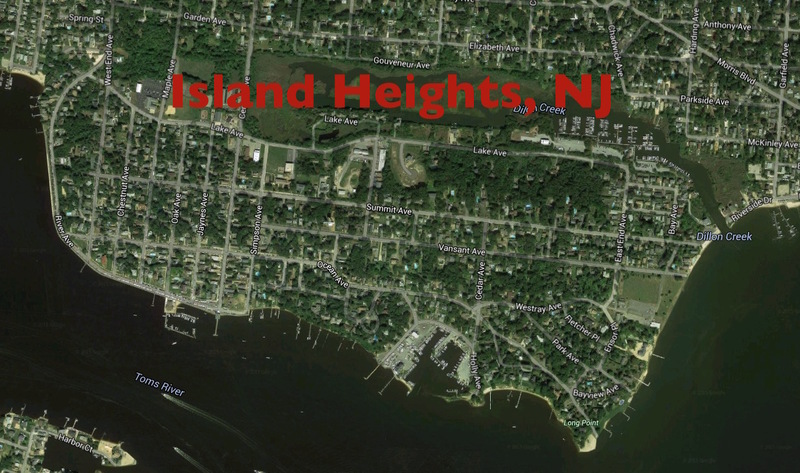 This is Island Heights, New Jersey along Toms River near where I spent a good portion of my youth. 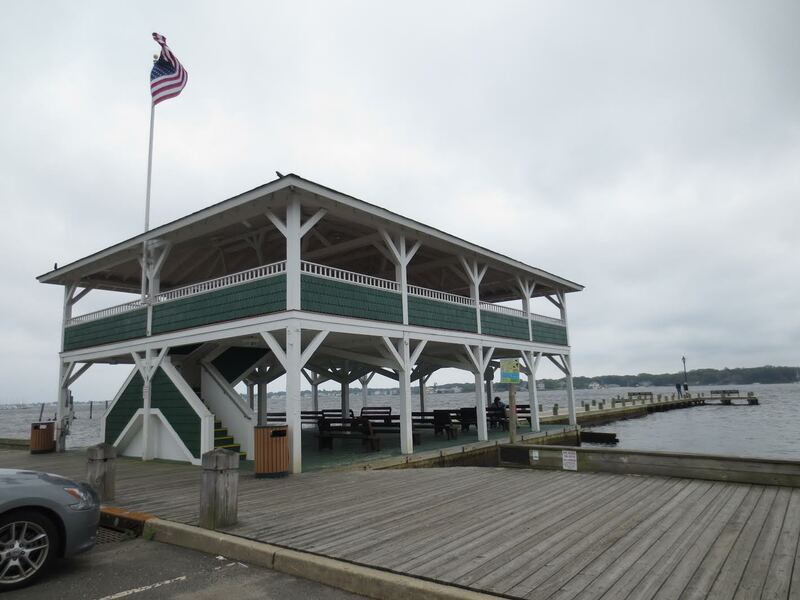 When the Victorians planned and built this town they set aside the best part of the riverfront for a public promenade, a two story gazebo, small public dock, and a modest little beach and boardwalk. Notice how the street grid runs perpendicular to the water. You can see the water from four or five blocks inland. The streets invite people to walk down to the river. 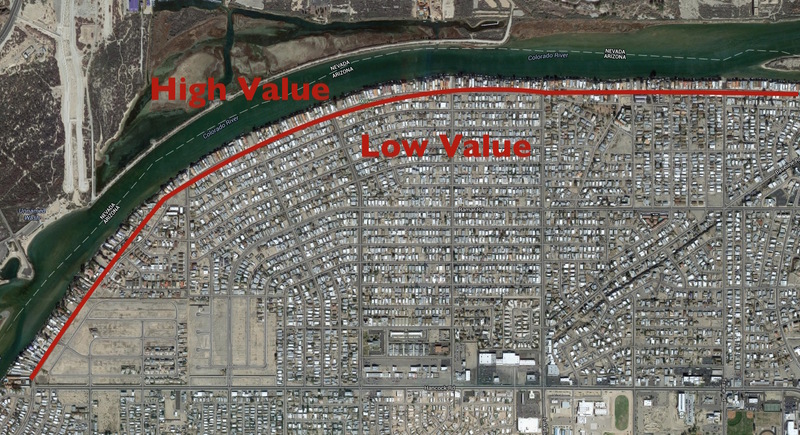 Here’s the result in property value distribution with a public rather than private waterfront. The largest most expensive homes are still right along the river. 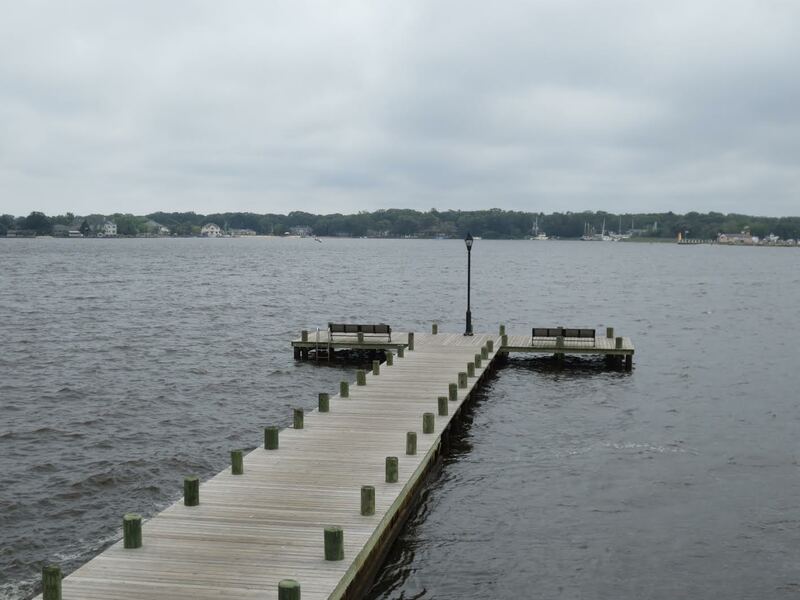 They have the best views and the most immediate access to the water. Property rights are rock solid as are market values. And just like Bullhead City the homes become considerably less expensive as you go inland. 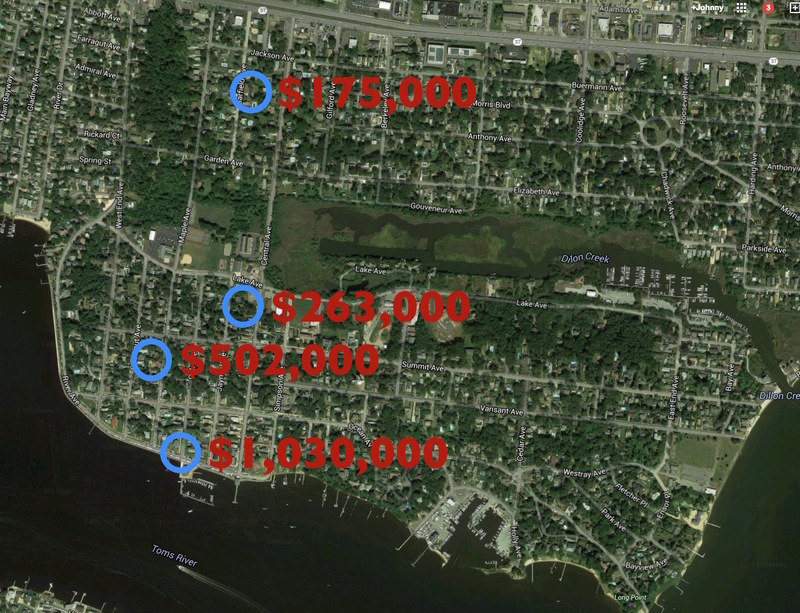 Current listings range from $1,030,000 along the promenade down to $175,000 five blocks inland. The difference is that even the most remote house in Island Heights still has access to the water. Not everyone can see it, but it’s there. People pay extra for that kind of thing. Kids can ride their bikes to the river. The elderly can walk along the promenade. Families can enjoy picnics at the gazebo. People can fish or dip their toes in the water. That thin sliver of open space adds huge value to every single house in the entire town. 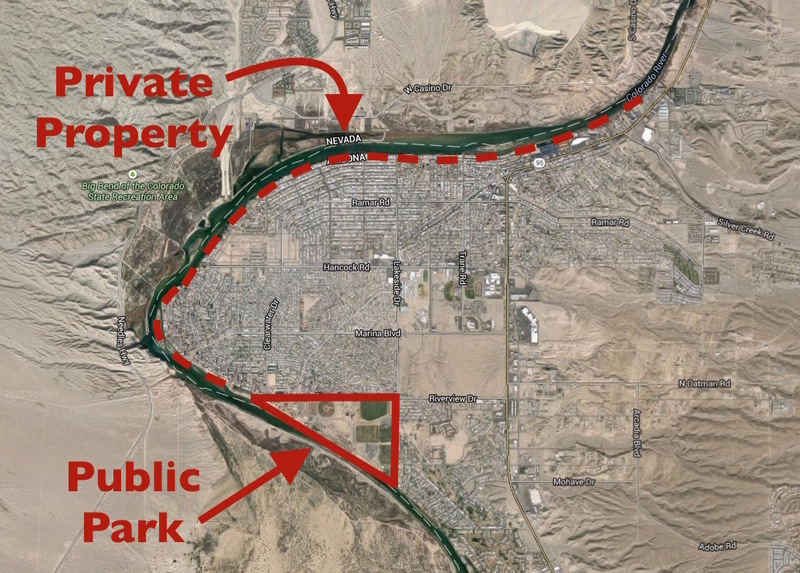 The developer who drew up the initial plans for Bullhead City could easily have created a similar public waterfront with streets running perpendicular to the river. The same exact homes and lots with precisely the same road standards, schools, shopping plazas and so on could have been distributed in a slightly different manner at the same exact cost, but with a radically better economic outcome for the whole town. Have you ever been to Lake Havasu City, a little bit south? Lots of their waterfront is not privatized. Much to find fault with. But because it’s a new town 3 hours from the nearest city, they had to include a cluster of denser housing and all the LULUs and couldn’t ask older commnities to pick up the burden of these. LULU. I had to look that one up. “Locally Unwanted Land Use” I like it. I think I’ll use that one in the future. 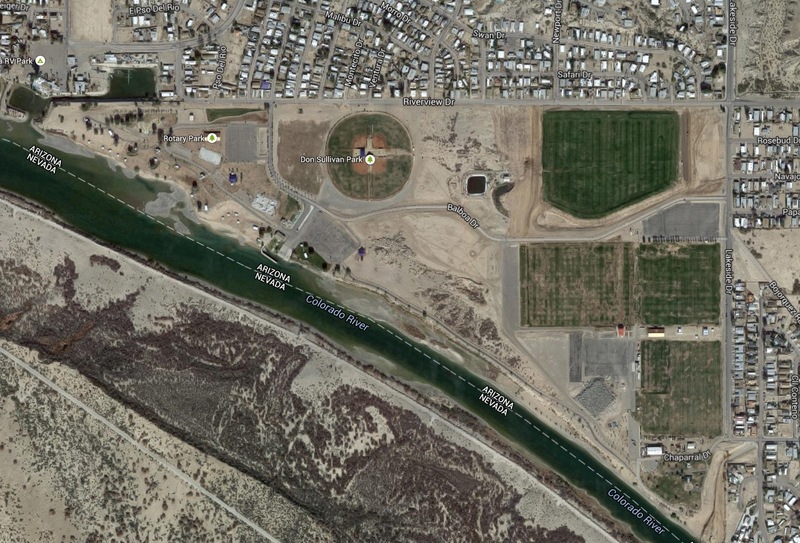 I got on to Google Earth and checked out Lake Havasu City. You’re right. 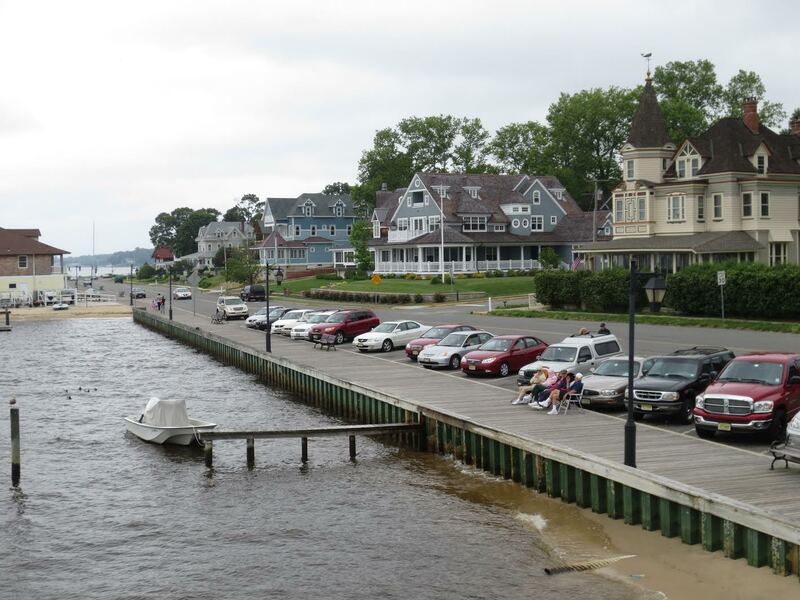 Much of the waterfront is public rather than private. And you’re also right that the city is dotted with some three story doughnut shaped apartment complexes that probably irritate the mobile home park residents, self storage facility people, and motel occupants across the street and around the corner. Let’s just say if there were an ugly contest it would be neck and neck all around. My parents own a vacation home in Bullhead, but it’s a new subdivision up off of Bullhead Parkway in the hills near Laughlin Ranch. I enjoy visiting the town because it’s quiet and dry and the pool is awesome when the air is 104 degrees. The casinos across the river depress me. One of my brothers is going to buy a retirement home in Bullhead. I have done what I can to discourage him, but it falls on deaf ears. I have tried to explore the original downtown core, but it is depressing. However, the only gay bar in western AZ is in Bullhead. The Lariat. Yee haw! Bullhead is one of those towns that makes me think, “how on earth will this place endure in the long run?” Maybe you’re right. Maybe it’ll surprise me, but so many of the people there are from somewhere else. They come for jobs in the casinos and the cheap retirement. They have very little binding them together. You make a very interesting point about the waterfront. My parents tell me the city is going to build a river walk sort of thing north of the area you called out. 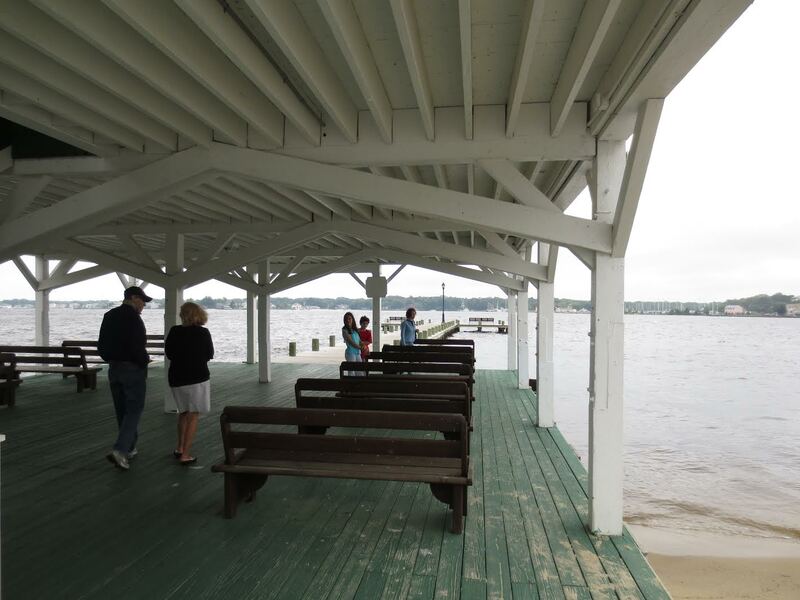 There is already a small park there and a boat launching area where they host the annual River Regatta, which is a booze fest on inflatable rafts. In my experience towns like this are rarely able to add meaningful public space after the fact. It’s not simply a physical problem, but a profound lack of understanding about what works and what doesn’t. I looked up the Lariat. According to the internet it closed… So much for local color in Bullhead City. While I think your analysis is accurate and important (how development patterns constrain and shape community resources and, hence, intensely affect overall economic value), it looks to me like Bullhead City is pretty much doomed even if it had been developed in a more egalitarian fashion. 2) Is it on a rail line that is in use or possible to put into use (passenger or freight) ? 3) Can its citizens get through the summer without air conditioning? 5) Has the town invested in renewable energy sources that can provide electricity if the grid goes down? 6) Does the town not require winter heating, or if it does, does the town have access to a renewable source of heat easily at hand (for example, passive solar or wood) or sufficient renewable energy? 7) Does the town have access to sufficient water for 30 gallons/person/day? 9) Are the people in the town already engaged in community activities, especially ones that strengthen social cohesion? I don’t see solar on their rooftops. They are thirty miles from a rail line. The houses are packed so closely together and surrounded by so much concrete, there is little space to grow food. I don’t see a downtown. Since it’s pretty far from anywhere else, I doubt it has any reason for it to exist except as a retirement community, and my guess is over the next fifteen years people are going to start retiring in place to keep continuity with their families and communities. As far as gambling goes, every little town across America is opening up their own casino to try to attract gambling dollars (or at least keep local gambling dollars at home.) (You should see the casinos in Iowa!) My guess is twenty years from now Island Heights, New Jersey will still be full of people and Bullhead City will be a newly-minted western ghost town. I agree with what you write, but I also think we might be surprised at what the future brings. Or how long it takes for things to change one way or another. One of the most important elements of success vs. failure in any given location will be culture. A desert town with all the liabilities and limitations you mentioned might pull through if the residents are industrious and like-minded. Mormons, for example, could pull together and make a town in a desert wasteland work. The current hodgepodge of folks in Bullhead City? Not so much. Then again there are locations that have every advantage that will probably fail because the citizenry just isn’t interested in adapting. Or the unified and action-oriented locals will take the wrong measures and make things worse. I can see entire towns deciding that heathens or immigrants or gays are the problem and exhaust themselves in witch hunts while things just get worse. So… prepare to be surprised.